Excitement is brewing! 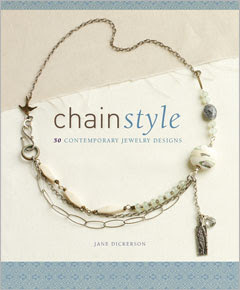 Back in October, I wrote a review of Chain Style by Jane Dickerson for Beading Arts. Well, I now have a copy to GIVE AWAY!!! As I wrote in my review, Jane has written this book for jewelry design beginners, who want it easy, stylish, and FAST! There are 50 designs to inspire you, which will give you a wide variety of styles. I'm sure you'll find some that catch your eye no matter how experienced you are. So here's my question for you: if you already make jewelry, what materials do you like best? If you don't make jewelry (yet), what would you most like to be making? :-) Leave me a comment below, and you will automatically be entered into the drawing, which will take place next Wednesday evening. Note: I've also got giveaways for different books starting today, Dec 9, 2009 on Jewelry & Beading and on Beading Arts. Feel free to sign up for those too! I love Stones and Pearls! of anykind. I am scared of wire, but am beginning to delve in. This book looks awesome for adding new techniques and incorporating chain and wire elements into my beading work. I'm really liking wire right now. I've been mostly using sterling silver and copper and I want to improve those skills and use other types of wires. I have a ton of chain sitting around that I'm not sure what to do with, so this book would be very helpful. I use mostly base metals and other found metals This book would assist me in making and incorporating the chain. Thanks for offering the giveaway! that cover's super cute. i use lots of cross-crafting when I can... crochet in my jewelry making, stenciling on sewn clothes, etc. I usually use beads. It depends on what I am striving for and who it is for. I primarily make for gifts. I have been wanting to expand my horizons on jewelry for a way and this book looks super fun. I would like to find a way to start using more natural materials like pieces of wood, shells, and rocks native to my area of the country. I also think it would be fun to experiment with creating some "found" jewelry, creating wearable art out of items others have discarded. I love wire wrapping. I can use just about anything (small) for jewelry once I jazz it up with some wire sculpture. The only type of jewelry I have made so far uses plastic canvas and embroidery floss, but I would really like to learn to make more types of jewelry! I like crystals, chain, solder & microscope slides as my standard medium, but am "trying out" plastic beads and vintage lucite findings. My chain creations that are sitting locked in my head are very extravagant. Waiting for a shipment of various chain to arrive! I'm am in the first steps of learning about jewelry making. I've wanted to do it for a long time and just this past week bought some fasteners, jumprings, beads, crimpers, a couple jewelry tools, and some ribbon for the necklace part. I'm starting off very simple. Going to Hobby Lobby next week to pick out some beginner books! 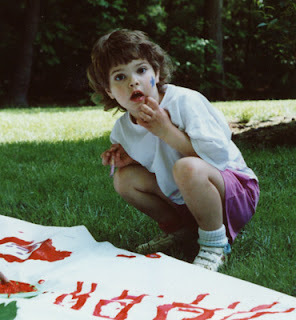 I'm already a crafter/artist, so I have lots of ideas of what I'd like to do just need to learn some basics first!! I'm so excited!! I like Vintaj style jewelry and also Deryn Mentock style. Your book looks great! I use beads and my handmade charms with lots of fibers to create jewelry. I'm rather new to jewelry making, but I decided to make pendants from recycled jewelry for a holiday swap that I am in. So I would say that I love using old, odd pieces of jewelry that most people would be throwing away. Gosh, this seems to have been missing...a great book for folks who have never made jewelery. I'd love to learn how to make necklaces. I know there's "something" to use to string them and also to space them but my ignorance is quite broad. I love to work with wire, I like to try making a byzentine necklace. I love the way wire is so versatile and would love to try different wire works. I love hematite and cherry quartz bracelets and necklaces. However my room mate is the jewlry maker and I'm more of the displayer. However i've been considering making my own pieces. However at this point in time the great American Aran afghan is taking a good chunk of my craft time. I'm almost a beginner. I took a wire wrapping class last year and love the half-round and square wires. I'm also learning to make polyclay beads. One day I'll "marry" the two and make jewelry!! As for now I have made some "chain" pieces but mostly in classes. This book would be right up my alley! Love new ideas and this looks like a great find. Using shells, vintage odds and ends is a favorite of mine. I am very new to jewelery making, having only made a few wire knit bracelets. I would really love some help and instruction to make some fab necklaces too. I usually bead with glass beads. I use chain a little bit for extenders, but have not made much using chain as a more primary element. Sounds fun! silver art clay...copper in any form!...and i love iron wire! I used to make pony bead necklaces with matching earrings. They were easy to make and I really enjoyed making them. Then I began making earrings from Christmas ornaments. Haven't made jewelry in ages but would love to get into wire bending/forming.